Medically researched and expertly engineered, the PainPod Mi uniquely combines two clinically proven technologies to give effective, natural drug-free relief from many types of pain, at the same time as treating and promoting healing at the source of your pain. Biologically body-friendly and sleek design, PainPod Mi can be used on almost any area of the body, lower back, arms, legs, stomach, feet or shoulders. 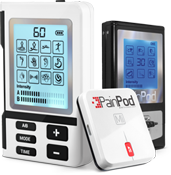 PainPod proprietary physical therapy technology. Manufactured in a medical grade facility and built to last. FDA approved, CE marked and a TGA listed medical device. Portable - you can use it virtually anywhere, anytime! Rechargeable lithium battery with a micro USB charging port. Enjoy theMi-Cycle pre-set 10 hour treatment period. Designed to fit comfortably in your hand. How does PainPod BiStim technology work to alleviate Pain? Using Transcutaneous bio-electrical nerve stimulation combined with proprietary frequency treatments and up-to-the minute advances in science waveform, PainPod Mi bio-electrically stimulates tissue through the skin to relieve pain. By interfering with the neural transmission of signals from underlying pain receptors, the BiStim effectively blocks the signals to the brain, helping the body to release endorphins that reduce your perception of pain. Gentle bio-pulses passing through the body boost blood-flow and improve circulation, supporting the body’s natural healing process. What is microcurrent & how does PainPod Mi-Cycle help healing? Every tissue type in the body has its own bio-electrical frequency which can be disrupted by injury or disease. The Microcurrent therapy engineered in the PainPod Mi-Cycle mimics the human body’s naturally occurring microcurrent to assist healing. At a current of one-millionth of an ampere it assists in normalising current and frequencies at a cellular level, resulting in improvements in pain, inflammation and increased function. Microcurrent works by stimulating an increase in Adenosine Triphosphate (ATP), the “molecular unit of currency" that fuels all biochemical functions in the body. Once the Mi-Cycle is activated, the device starts to work immediately and is preset for a 10 hour treatment period. The low ampere PainPod Microcurrent doesn’t stimulate sensory nerves so is imperceptible in use. There is no feeling or sensation. PainPod Mi is suitable for use with Bio Gloves, Bio Socks and Premium Pads. We do not recommend using the PainPod Mi with Bio Belt, Bio Shoes or EconoPads.